How to learn German texts for your exam. In this post I am sharing with you how to learn German texts for your exam. Often the young students I work with ask me how they can prepare for their written and oral exams. I would say the best preparation is learning your vocabulary on a regular basis, keep adding new words and also paying attention to grammar. Make sure you understand grammatical concepts and know which cases to use, how to spell words, how to conjugate your verbs in each of the tenses, how to create proper sentences and so on. Understanding the grammar of any given language is so important. When you have a rich vocabulary to draw upon, essay writing becomes so much easier. However, this takes time to develop and typically what I see with my young students is this: They have lots of gaps in their vocabulary and often are not able to remember simple words (after years of study at school), or which cases to use or conjugate in the past, present and future tense. Exams seem to work on the principle that you get told beforehand what exactly you have to learn. Usually it’s a 300 to 500 word piece of text on a given topic for GCSE students. So they write this either at school or at home, show their teacher who corrects it and then they are tested on that particular piece of text. I have no idea what learning is achieved in this way. But it’s the system and students have to jump through these hoops to achieve good grades. When the gaps in their knowledge are very big, this is really not easy for them. This way of learning is a bit alien to me. At school we often had surprise vocabulary tests. We also had to prepare whatever we learnt in a given period of time for an exam. We also couldn’t prepare a longer piece beforehand because we wouldn’t know what the exact topic would be, we only had a rough idea. We had to rely on what we have learnt – not parrot things. Of course I want to help my students and learning texts by heart is not that easy, especially in a foreign language. So this is what I tell my students. 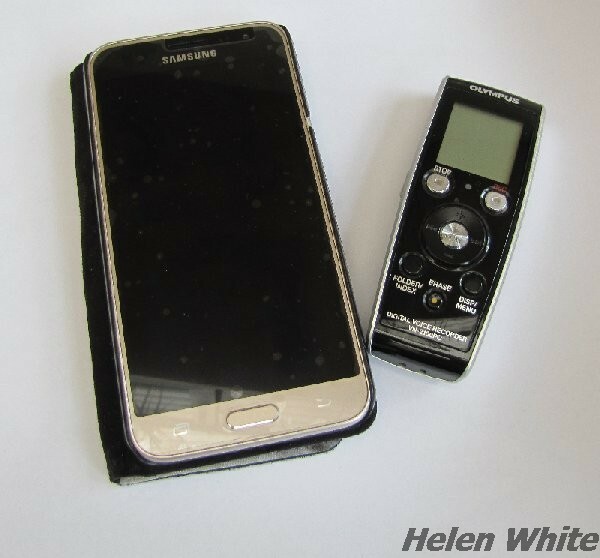 Mobile phone and my old digital dictaphone for recording text. How to learn chunks of German text for oral exams. Break down the text in smaller chunks – 2 or 3 sentences, depending on the length of the sentence. Learn the first sentence, by reading it out loud. When you can pronounce words with confidence it’s so much easier to remember these words. Use a Dictaphone or your mobile and record yourself, play back the recording and then check if you have remembered the sentences correctly. Repeat this with every small chunk of text. Have a break from it for an hour or so to let it all sink in. Finally try and record yourself speaking the whole text and check your recording. Alternatively ask your mum, dad, friend or other half to listen to you and correct. This method works well for oral exams, but can of course also be used for written exams. However this is obviously not enough to learn the spelling. How to learn chunks of German text for written exams. Break down the text in smaller chunks 2 or 3 sentences, depending on the length. Learn the first few sentences, by reading them out loud. Then write them down. Check if you have written them down correctly. Repeat this until you reached the end of the text. Write down the whole text in one go. Check it and correct where necessary. Have another break and then try this and set your alarm to the required time you would have in the exam. No cheating! I hope you find these tips useful- these methods apply to all types of learning things by heart and are not exclusive to the German language.